In Brisbane, one of the earliest to attend was activist-musician Phil Monsour. Like he’d done during the Children’s Hospital dispute in 2012, the Patrick waterfront lockout in 1998 and as far back as the SEQEB electricity workers dispute in 1985, Monsour was there with his guitar to show solidarity and contribute music to the struggle. Standing on a concrete barrier next to the gates to Hutchison’s terminal, he played union standards and songs of his own, and spoke about the importance of workers sticking together. The sacked wharfies and their supporters responded warmly. Monsour had been introduced to the crowd by the MUA’s newly-elected Queensland secretary, Bob Carnegie. In his speech, Carnegie emphasised that rank-and-file solidarity and resilience were essential to victory. To beat the bosses, he said, the union had to stick it out “one more day than them”. It was a powerfully simple message and the words stuck in Monsour’s brain. Within days of hearing the slogan, he had turned it into the title and refrain of a new song. “One More Day than Them” is a tribute to the fighting spirit of the Hutchison workers. The song transcends the particular events of its making to offer a universal message of inspiration to people resisting the power of capital. Six months later, Monsour was on a picket line with his guitar again, this time outside the Lady Cilento Children’s Hospital in South Brisbane. An injured refugee child — Baby Asha — and her mother in the hospital were being threatened with relocation back to Australia’s infamous immigration detention centre in Nauru. The community and unions had mobilised for a round-the-clock vigil to prevent their forced removal. Out of that experience Monsour wrote “Let Them Stay”. Again, he drew on the particular events to make a broader point, in this case about the hypocrisy and brutality of Australia’s offshore refugee processing regime. 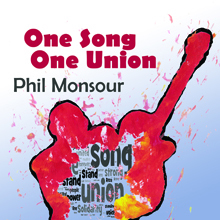 Inspired by these two events, Monsour conceived an album that would feature new labour songs, each work commissioned by an individual union with lyrics reflecting the issues and experiences of its members. The Queensland Council of Unions and six unions signed up for the project: the Maritime Union of Australia (MUA), the Queensland Nurses and Midwives’ Union (QNWU), United Voice, the Australian Manufacturing Workers’ Union (AMWU), the Queensland Teachers’ Union (QTU) and the Electrical Trades Union (ETU). The album that resulted, One Song One Union, was launched in May. It features “Let Them Stay”, which Monsour dedicated to the Refugee Action Collective, and seven union songs: “One More Day than Them” (for the MUA), “Still Need a Union” (QCU), “Better Work Better Life” (QNWU), “One United Voice” (United Voice), “What Will Our Children Do?” (AMWU), “Stand Together” (QTU) and “Not for Sale” (ETU). It also includes two covers Monsour regularly performs live — “Solidarity Forever” and the Warumpi Band’s “Blackfella Whitefella” — plus two other compositions of his own, “Who Killed Reza Berati?” and “Stand with Us”. One Song One Union is a fascinating and absorbing CD that breaks new ground in the relationship between popular music and organised labour. The folk tradition, both in its acoustic and electric forms, and the community-based choral tradition, boast rich histories of writing and recording union songs and supporting the struggles of working people. But even they have rarely witnessed such a systematic creative collaboration between musicians and trade unionists. On the other hand, within Monsour’s own field, rock music, contributions to the labour cause have been rarer. When Bob Dylan went electric, he wrote great songs, but left behind his already tenuous connection to the union movement. This seemed to confirm a pattern. Rock’s politics can be progressive, even revolutionary, but the detached and self-obsessed lifestyle associated with it tends to be at odds with the traditional collectivism of organised labour. Above all, rock is an industry, controlled by moguls interested only in selling “product”. Folk has its commercial side too, but the quintessentially democratic nature of the acoustic form has kept it closer to its roots. Purveyors of labour movement rock’n’rollhave been like flashes in the night sky. Rock Against Racism in Britain in the 1970s showed what was possible. And who can forget The Clash’s “Know Your Rights”? Taking a more systematic approach, a few musician-activists like Billy Bragg and Alistair Hulett have cultivated the solidarity possibilities of punk’s DIY ethic. Hulett’s outfit Roaring Jack was arguably the political highpoint of this development. These pioneers, however, failed to launch a tradition. Tellingly, after Hulett’s band folded he reverted to conventional folk as a solo performer. And Bragg’s music has always been closer to electric folk anyway. One can easily imagine his great labour anthem, “Power in the Union”, in the repertoire of a Woody Guthrie or a Pete Seeger. So now Monsour has stepped forward, a trailblazer for the concept of rock’n’roll as a tool of union mobilisation. This courage, in the end, is what makes the songs on One Song One Union so different, surprising and fresh. This is union music that packs a sonic wallop, delivered with an energy and verve of which Joe Strummer would have been proud. Even “Solidarity Forever” gets a punkish makeover here. The tempo is upbeat and the choruses big and infectious; the songs are built on tight, insistent drumming combined with Monsour’s signature emphasis on guitar, bulked up with a driving brass section to create a sound not dissimilar to Hunters and Collectors in their heyday or the recent touring bands of Bruce Springsteen. Of the few slower songs on the CD the standout is “Let Them Stay”, a stunning ballad in which Monsour’s aching vocals are accompanied by a single austere keyboard. Probably the closest we have to a precursor for the One Song One Union project is Mark Seymour’s album Westgate, which included songs that emerged from his collaboration with the Victorian Trades Hall and the CFMEU. But whereas Seymour’s foray was tentative and his union references understated, Monsour’s project constitutes a total engagement. It takes union collaboration to a new level, informed by Monsour’s lifelong commitment to working-class emancipation and his position as a worker-activist within the very struggles he writes about. This is music from the inside, and it shows. The songs are constructed to be sung by unionists and not just at them. They are, in the deepest sense, songs of defiance, designed to lift the spirits and engage the passion of people involved in the struggles of the day. They may be rock’n’roll, but they are also picket line songs, union hall songs, songs for collective participation, calling out for combined voices. They would make terrific soundtracks for union rallies or organising videos. One Song One Union is a testament to the value of music in politics. It is also an important historical document, articulating our situation. The songs tell of a workers’ movement on the defensive. Market forces push into our public services, wharfies are sacked in the night, wages stagnate, shifts are long and dangerous, refugees are murdered with impunity. “What will our children do?”, Monsour asks, echoing the fears of AMWU members whose jobs are disappearing. But pessimism never swamps the recording. There is plenty of hope here. The Hutchison workers walk back through the gates. Baby Asha is allowed to remain in Australia. Teachers and nurses hold the line in defence of the services they deliver. The ETU defeats another push for privatisation. The album resonates with the message of defiance. It celebrates our determination and resilience. It defines our heroism. Shared on the national day. To stop a child being taken away. One Song One Union is full of lyrical gems like this. Get a copy and play it at your next union meeting. Play it with the volume up.